SAN ANTONIO, Texas – The Hispanic Association of Colleges and Universities (HACU) and Freddie Mac on March 3 will launch a free consumer credit education initiative targeting the nation’s fast-growing Hispanic communities. U.S. Treasurer Rosario Marin will join U.S. Congressman Charles Gonzalez of Texas, U.S. Congressman Ciro Rodriguez of Texas, HACU President Antonio Flores and Freddie Mac Vice President Jim Park to launch the national campus edition of CreditSmart Español, a new bilingual financial literacy initiative from Freddie Mac. They will join campus, student and community leaders at a news conference at 10 a.m. Monday, March 3, in San Antonio, Texas, at the University Center at St. Mary’s University, where 68 percent of undergraduate students are Hispanic. 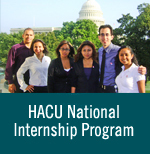 The CreditSmart Español initiative will be introduced this summer and fall at HACU member colleges and universities serving predominantly Hispanic communities in California, New York, Florida, and Puerto Rico. Free classes will be offered to students and participating members of the community on building strong consumer credit and money management skills, with an emphasis on preparing participating consumers for potential homeownership, college for their children and other life-long financial goals. CreditSmart Español course materials in English and Spanish will be available to college students and their families and neighbors in an effort to reach a broader cross-section of Hispanics -- the nation’s youngest and largest minority population, and also the fastest-growing U.S. consumer group. “As a founding member of HACU, St. Mary’s University has been a national leader in education and service outreach to the larger Hispanic community, as well as to students,” said HACU President and CEO Antonio Flores. HACU, which has its national headquarters in San Antonio, represents more than 340 colleges and universities serving the largest concentrations of Hispanic higher education students in the United States. “We’re excited to become the first HACU member higher education institution to offer this valuable new learning opportunity to our students and their families,” said St. Mary’s University President Charles Cotrell. College students today already are burdened with a dramatic rise in higher education costs overall, correspondingly heavy student loan responsibilities and an uncertain employment outlook upon graduation, said Rosario Mendez, program manager for the HACU/Freddie Mac CreditSmart Español partnership. “For Hispanic students, who suffer a disproportionately high college debt-to-income burden upon graduation, this project is going to prove especially beneficial in teaching them sound credit and money management skills,” Mendez said. HACU and Freddie Mac are introducing CreditSmart Español to college campuses and communities as part of their role in a wider CreditSmart Español outreach partnership with other leading Hispanic organizations. Freddie Mac is a stockholder-owned corporation chartered by Congress to provide a continuous flow of funds to mortgage lenders to sustain a stable mortgage credit system, thereby reducing mortgage rates paid by U.S homebuyers. Since its inception in 1970, Freddie Mac has opened doors for one in six homebuyers and 2 million renters across America.